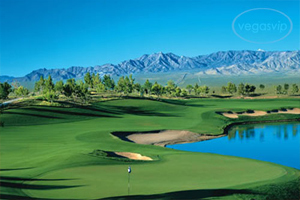 The sport of golfing in Summerlin brings a new meaning to the term fun and relaxation. Enjoyable and family oriented, Summerlin is now the place to be in every aspect. Set aside from the normal transient and sometimes chaotic Las Vegas lifestyle, this is a quiet and strong community that takes pride in putting they're residents first. 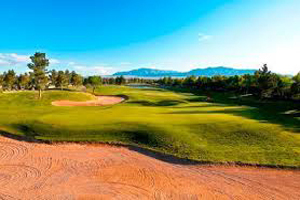 To the enjoyment of many Las Vegans, Summerlin has taken quiet living yet a step further by giving golfing participants of any age or playing skill level, the opportunity to go from ordinary to extraordinary. Palm Valley is one of three major golf courses that the Dell Webb Community has to offer. This course is the most complex and difficult golf course of the three. It was established in 1989 by both very talented and rather unique Architects, Billy Casper and Greg Nash. Not only is the Pine Valley golf course completely complex and challenging, but it can be a bit on the extreme side from the very first moment of tee off. Between the sixty eight strategically well placed bunkers and the devious, yet completely beautiful rolling bent grass, the golfer has the amazing and pleasurable challenge off getting a par. There is never a dull moment at Palm Valley and if you are looking for great tournament play, this is the place to be. The personable staff welcomes groups of fifty or more players. However if tournament play is of no interest to you or if you are not in a group and are just looking for a break from the reality of a hectic everyday life, then make sure you give Palm Valley the chance that many have experienced. They do offer tee times starting at just $25.00. Green fees are the same seven days a week and range from $100 to $250. This course offers year round play, and comfortable dress attire. NO cutoff pants or swim wear are allowed, but don't worry if you do not have the normal stuffy slacks that are required at some courses. At Palm Valley, there is plenty of room for a crisp and neat collared shirt and denim is allowed as well. If there are any questions regarding dress code, feel free to contact the main office. If you are not an experienced player, but are interested in learning the art of the game, or even if you need to brush up on some necessary skills. Palm valley offers a putting green, chipping area and teachers that take the time to teach you, one on one to get the full learning experience. They will have you playing not just the way you need too to compete, but the way you want to.